(Bridgeport, Conn., April 4, 2017) – Bridgeport Bluefish team officials have announced that five more players have been signed for the 2017 season: right-handed pitchers Manny Delcarmen, Vinnie Pestano, Charles Brewer, and Cory Riordan, as well as catcher Santiago Nessy. Manny Delcarmen comes to Bridgeport for his 17th year of professional baseball and first in the Atlantic League. Last year, the World Series Champion made two mound appearances for Saltillo of the Mexican League. In 2015, he split time between Mexico City of the Mexican League and Triple-A Syracuse (Washington Nationals) of the International League. In 47 combined games, he collected a 3.09 ERA with 36 strikeouts in 46.2 innings pitched. The Massachusetts native was selected by the Boston Red Sox in the second round of the 2000 MLB draft, and made his professional debut the following year with the Rookie-level Gulf Coast Red Sox of the Gulf Coast League. He spent ten seasons with the Red Sox organization, making his big league debut in 2005 after being called up from Triple-A Pawtucket of the International League. He went on to win a World Series ring with the Red Sox in 2007. That year, he was an integral member of the team, tossing 44.0 innings and striking out 41 batters with a 2.05 ERA. In 2010, he joined the Colorado Rockies, and has also spent time with the Seattle Mariners, Texas Rangers, New York Yankees, Baltimore Orioles, and Washington Nationals organizations. In 298 career Major League games, the pitcher owns a 3.97 ERA with 249 strikeouts across 292.2 innings. In 331 career minor league games, Manny has collected a 3.81 ERA with 641 strikeouts in 636.0 innings pitched. Vinnie Pestano joins the 'Fish for his first season in the Atlantic League and 11th of professional baseball. Last year, the six-year MLB veteran made eight appearances with Triple-A Scranton/Wilkes-Barre (New York Yankees) of the International League, earning one victory with a 3.38 ERA and 16 strikeouts in 10.2 innings of work. The 32-year-old was drafted by the Cleveland Indians in the 20th round of the 2006 MLB draft, making his professional debut the following year with Low-A Mahoning Valley of the New York-Penn League. Pestano made his Major League debut with the Indians in 2010 and was with the team until 2014 when he joined the Los Angeles Angels of Anaheim. In 223 career big league games, he owns six victories with a 2.98 ERA and 244 strikeouts in 202.2 innings pitched. In 262 career minor league games, Vinnie owns 12 victories with a 2.46 ERA, 87 saves, and 306 strikeouts across 271 innings. Charles Brewer joins the Bluefish for his first year in the Atlantic League and ninth of professional baseball. Last season, the former big leaguer played three games with Double-A Mobile (Arizona Diamondbacks) of the Southern League. In a combined 8.2 innings, he struck out eight batters and earned a 1.04 ERA. The Arizona native began his professional career in 2009 after being selected by Arizona in the 12th round of the 2009 MLB draft. He has spent nearly his entire career with the Diamondbacks organization, with the exception of 2015 when he was a member of the Cleveland Indians system. He had a brief stint with the Diamondbacks big league club in 2013, making four mound appearances and collecting a 3.00 ERA with five strikeouts across 6.0 innings. In 145 career minor league games, Charles has a 4.01 ERA with 650 strikeouts in 747.0 innings of work. Cory Riordan returns to Bridgeport for his second season in the Atlantic League and tenth of professional baseball. The Connecticut native pitched for the Bluefish in 2015, making 18 mound appearances (17 starts) and earning five victories with a 3.62 ERA with 82 strikeouts across 117.0 innings pitched. Midway through the season, his contract was purchased by the Lamigo Monkeys of the Chinese Professional Baseball League. He returned to Bridgeport and finished the 2015 campaign with the 'Fish, and was then signed by the Detroit Tigers organization that following offseason. Last year, he split time between Triple-A Toledo of the International League and Double-A Erie of the Eastern League, both affiliates of the Tigers. In 27 combined games, Riordan earned six wins with a 4.86 ERA and 113 strikeouts in 153.2 innings of work. The pitcher was originally drafted in the sixth round of the 2007 MLB Draft by the Colorado Rockies and spent seven years within the organization, reaching as high as the Triple-A level. In 197 career minor league appearances (174 starts), Cory owns 54 victories with a 4.39 ERA and 924 strikeouts across 1,168.1 innings. Santiago Nessy joins the Bluefish for his first season in the Atlantic League and eighth of professional baseball. Last year, the catcher played for High-A Tampa (New York Yankees) of the Florida State League. In 38 games with Tampa, he hit one home run with 11 RBI and 13 runs scored. Nessy began his professional career in 2011 with the Rookie-level GCL Blue Jays (Toronto) of the Gulf Coast League. He spent five seasons with the Blue Jays organization, reaching the High-A level in 2014. In 2015, he joined the Kansas City Royals organization and split time between Double-A Northwest Arkansas of the Texas League and High-A Wilmington of the Carolina League. In 364 career minor league games, Santiago owns a .239 batting average with 25 home runs, 149 RBI, and 139 runs scored. The Bridgeport Bluefish are members of the Atlantic League of Professional Baseball and play their home games at The Ballpark at Harbor Yard. 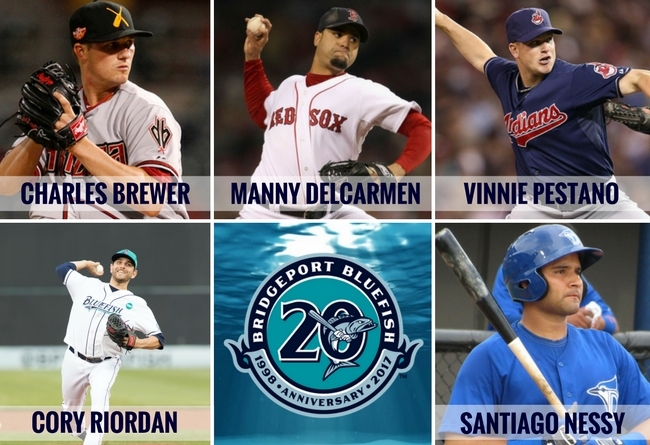 For further information, call 203-210-BLUE (2583) or visit www.BridgeportBluefish.com.